When “water” is used as a solvent, the “transition state” is stabilized to a greater extent than the reactant and the product. 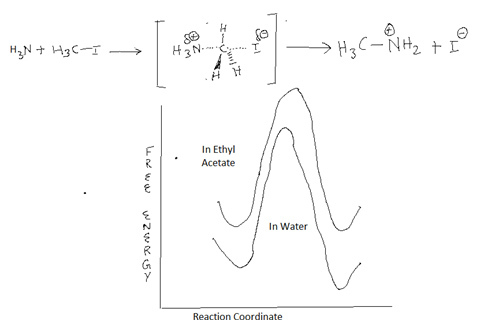 Thus, the reaction is accelerated in water compared with the rate observed in ethyl-acetate, which is a less polar solvent. Water is more capable than ethyl acetate in stabilizing ions, by both donating and accepting hydrogen bonds.